According to a new study, firefighters are fighting more than fires — they’re also battling deadly cancer. Our nation’s 1.1 million firefighters are among the first responders to save people in an emergency––and among the first to come in contact with hazardous materials such as asbestos. 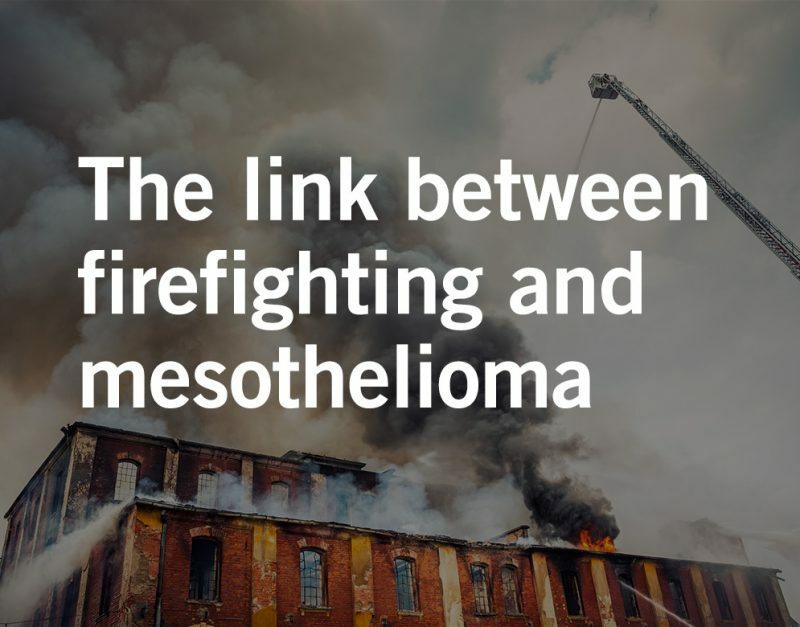 A study funded by the U.S. Center for Disease Control (CDC) reports that firefighters have a twofold rate of mesothelioma compared to the general public. EMAIL OR CALL 800.226.9880 TO SEE HOW WE CAN HELP. Firefighter Lt. James Carney serves as a perfect example. He died at the age of 43 from pericardial mesothelioma, a rare cancer caused by asbestos exposure. Medical examinations determined Lt. Carney’s disease was the result of repeated exposure to asbestos while he was out fighting fires. Studies have linked toxins found in fires to heightened cancer risk for firefighters. The science on the link between cancer and firefighting is still growing. However, it has already become a hot topic in Congress where the Firefighter Cancer Registry Act (H.R. 931) was signed into law in July 2018. Under the Act, the CDC will collect data through a volunteer registry. This is part of the agency’s ongoing research into whether firefighters’ work increases the odds of developing some types of cancer. Congress is not the only entity exploring the connection. The Firefighter Cancer Support Network also has an interest in tracking the link. It maintains that cancer was the cause of 70 percent of career firefighter line-of-duty deaths in 2016. The advocacy group also notes that firefighters have a 14 percent higher risk of dying from cancer than the public. This does not include the increased risk of dying of cancer among volunteer firefighters who represent about 70 percent of the nation’s 1.16 million firefighters. A study conducted by the CDC’s National Institute for Occupational Safety and Health (NIOSH) found higher rates of certain types of cancer among firefighters than in the general U.S. population. The study also found that there were about twice as many malignant mesothelioma cases than were expected. The findings suggest that this is an occupational disease resulting from asbestos hazards in the workplace. According to the study’s lead author, the primary cause of the firefighters’ cancer is exposure to asbestos in buildings while fighting fires. Mesothelioma, the deadly cancer caused by asbestos exposure, is known to have a long latency period. The study found the average time between the date first employed as a firefighter and the date of diagnosis was 45 years. The number of lives lost as a result of the carcinogens with which firefighters come in contact will only continue to grow as firefighters face new, larger, and more intense dangers. Experts agree that asbestos has a cumulative effect contributing to asbestos-related diseases, so each exposure to toxins serves to increase the risk to these first responders. In locations, like California where the wildfire season has expanded to a year-round phenomenon due to the increasing effects of climate change and communities are built ever closer to the wilderness, the danger of toxins is heightened. Because asbestos was common in construction products used to build older homes and structures and because of the extended fire season there is a greater chance that firefighters will be exposed to asbestos more often, which increases the risk of disease. Some of the likely sources of asbestos exposure during a fire may include joint compound, floor and ceiling tiles, siding, shingles, and insulation. Manufacturers of asbestos-containing construction materials profited greatly from the sale of their dangerous products for years but those products continue to endanger people everywhere, including first responders. The asbestos attorneys at Waters Kraus & Paul take pride in being able to help victims of asbestos exposure. We have worked with people in a range of industries from construction to oil and gas. Our asbestos attorneys have experience pursuing mesothelioma lawsuits and will work to ensure you get the compensation you deserve. If you have been diagnosed with a disease caused by asbestos exposure, such as pleural mesothelioma or lung cancer, email or call 866.295.4518 to see how the asbestos attorneys at Waters Kraus & Paul can help you seek justice.